Defence Metallurgical Research Laboratory was established at Hyderabad in 1963 to meet the needs of complex materials for modern defence applications with a mission to develop advanced materials, innovative process technologies and related product engineering supported by basic and applied research. The vision of DMRL is to be a centre of excellence for providing total material solutions for defence systems. Candidates should possess B.E/ B.Tech with first division in Metallurgical Engg/ Materials Science and Engg/ Materials Technology/ Metallurgical and Materials Engg along with NET/ GATE qualification for S.No-1 (a), M.Sc in Physics with first division along with NET/ GATE qualification for S.No-1 (b), Ph.D in Metallurgical Engg/ Materials Science and Engg/ Materials Technology/ Metallurgical and Materials Engg for S.No-2 (a) & Ph.D in Physics for S.No-2 (b). 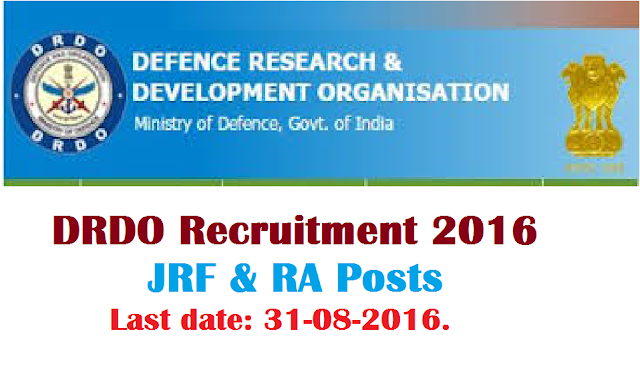 Candidates upper age should be 28 years for JRF & 35 years for RA as on the date of interview. Age relaxation is applicable to SC/ ST & OBC candidates as per GOI rules. Eligible candidates send their application in the prescribed format through e-mail to admin@dmrl.drdo.in on or before 31-08-2016 &attend for interview with a set of attested photocopies of all testimonials, two recent colour passport size photographs & originals. Last Date for Submission of Application: 31-08-2016.